This spot/location is called “Portas do Sol” (Sun’s doors) for a good reason. Here one can have all the sunshiny views that Lisbon has to offer. Close by the bar, there’s the Saint George’s castle, Alfama, Sé (the cathedral) and down there, the river Tejo. A bar with such an astonishing view is reason enough to pay it a visit. But this bar offers much more. It’s modern, well designed, with very “cool” staff and with a broad offer of food and drinks. And exceptional for an open door bar like this: surprisingly clean! 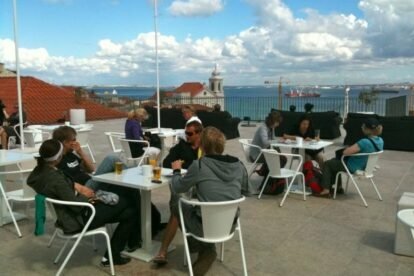 From lunch to snacks, juices to wines, and a reasonable selection of tea, you can sit on their relaxing black sofas and have whatever you want with the best view Lisbon has to offer, as a bonus! The bad news about this bar is that once you are there, it is really very hard to leave. The good news is that, when you do, you can get the famous Tram 28 that passes just by.